Did you know that NHS England publishes information on hospital quality and Inguinal hernia operations within England? If you are considering your hernia repair option in the UK this is a good place to start. Even though data is specific to England, patients in other regions can get some insight into the best choice for your operation and metrics to compare against. We looked at the data to see what interesting things we could find. An example of the published open-source data can be seen here... or you can simply visualise it as a map. Data is only published for England and excludes Wales, Northern Ireland and Scotland. are not done but more likely no data is available from a hospital. Hospitals that did not publish inguinal hernia-related data sets were omitted. Data was collected on 15th December 2015. 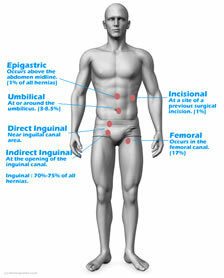 Where can you go to get your Inguinal Operation done? There are 793 Hospitals in England, but only 168 publish statistics on Hernia Operations and this excludes for the most part all private clinics and hospitals. Hernia Operations fall under the 'General Surgery' category which despite its name is not done at every hospital. If multiple hospitals are within the same NHS Trust the Operation number is allocated across Hospitals in the catchment zone so this again can make some Trusts look busier than others. What can we tell about the Hernia statistics that are published? So Hospitals or Trusts that perform a higher number of operations should be centres of excellence. Simply put they practice their particular hernia repair technique more often and should have better patient outcomes. We find that 100+ Operations per year could be a good proxy for competency. If your local hospital is doing under 100 operations a year you may want to consider an alternative centre. The total number of hernia operations is considerably under-reported, no statistics for private hospitals and clinics are available, although they are clearly offering hernia operations. to operation day. On average you will be waiting just under a month for your operation across NHS England. Criteria for selection: Selected from Hospitals that published data on Hernia Operations. The Hospital Data set in CSV format can be downloaded here.